I recently picked up this fun little wine from my friends at the Wine & Cheese Cask in Somerville, MA… The wine was advertised as “nice, fruity fun, but with enough sappy concentration that it will match with anything.” The advertisement also offered a warning: “One bottle may disappear before dinner is over. It may disappear before dinner is prepared.” As you might expect, such words piqued my interest. I’m glad to say that there is truth in advertising here… mostly. The wine is certainly fruity and fun and there is enough breadth across the palate to give the wine some legs. The acid level makes the wine a good partner with many cuisines, but the decided absence of tannin may cause the wine to flag in the face of truly prodigious dishes… a hearty, grilled steak for instance might cause this imp of a wine to flinch. The wine is also my first domestically acquired Vin de France. The story behind the wine goes like this. The producer, Marcel Lapierre owns a lot of property in Beaujolais, mostly in the Cru of Morgon. Actually, Lapierre is something of a celebrity in Morgon, earning a reputation for making some of the finest wines in the appellation. Both of his Morgon wines are from vines that average between 60 and 100 years of age and have dramatically low yields. The subject wine, however, is made from grapes harvested from much younger vines (average age less than 20 years) and the grapes are taken from plots within and without Morgon. Because Beaujolais lacks a Vin de Pays designation, the only thing a wine producer can do when using grapes from across AOC appellations is to designate the wine a Vin de France. Given the provenance of the wine, I’m just fine with the situation. 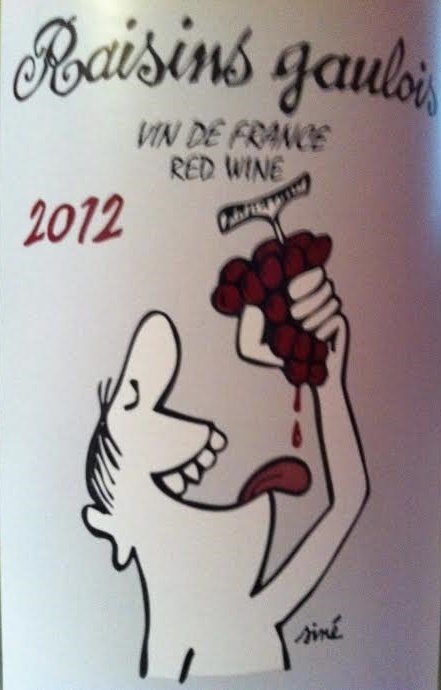 The wine is 100% Gamay, grown on the classic granitic soils of Beaujolais. While I did not detect much in the way of mineral or stone, the wine does have that unmistakable Gamay nose and palate that suggests ripe, fruity grape juice, just squeezed from the press. Good thing too, because a quote from Marcel on the Kermit Lynch website states emphatically: “Our ideal is to make wine from 100% grape juice.” Somehow I thought that was every winemaker’s ideal, but what do I know… Our price here in MA is around $12.99 per bottle pre-discount – a good value in my book. Ripe, fruity nose with sweet cherry and wildflower hints. Medium-bodied with moderate-to-firm acidity and supple tannin – good balance. Youthful with a juicy, lively palate. Extremely quaffable. Moderate length with a smooth, albeit simple finish. Some hint of spice and pepper showed vaguely on the aftertaste. Drinking, or should I say quaffing, well – not for aging. Although, the wine is closed via Stelvin, so I would expect the wine to remain fresh and lively for a few years to come. Good value. Stingers date back to pre-Prohibition days and were considered something of a night cap or “settler” after an evening’s carousing. 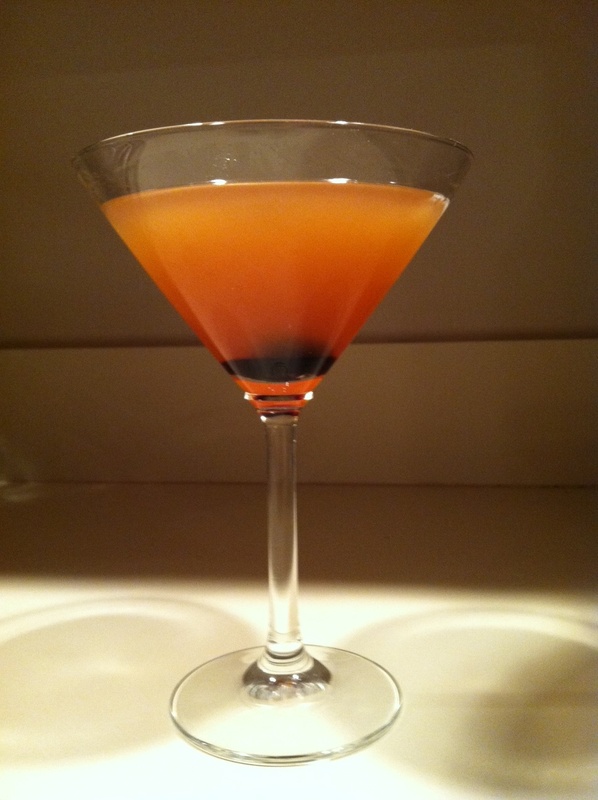 According to Esquire magazine, they were also the preferred cocktail of returning fighter pilots from WWII. I suspect the tingle of peppermint provided the missing excitement of aerial combat. Combine the ingredients and shake vigorously with crushed ice. Strain into a chilled cocktail glass. 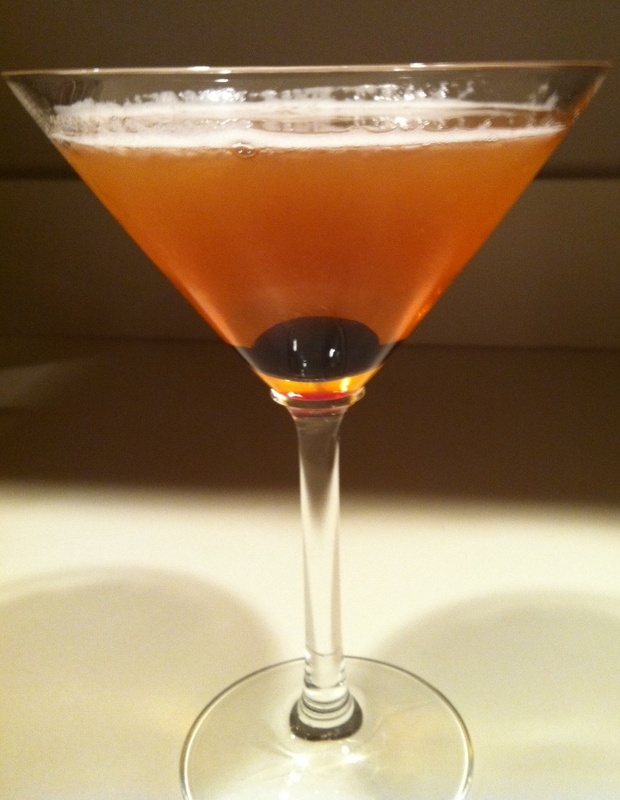 Garnish with a Luxardo Maraschino cherry, if desired. With the continued cold and snow in the Northeast, a lot more brown liquor is getting poured in our household. This is not a negative, just an observation and in an effort to cut through the effects of reduced vitamin D, I have taken to experimentation. Many folks know of the famous Bellini cocktail, invented by the owner of Harry’s Bar in Venice somewhere between the end of Prohibition and the end of WWII (1933 – 1945). The drink was so named because Giuseppe Cipriani, the owner of Harry’s felt the color of the cocktail was reminiscent of the color of a saintly robe found in a 15th century painting by Giovanni Bellini. The rest is history. 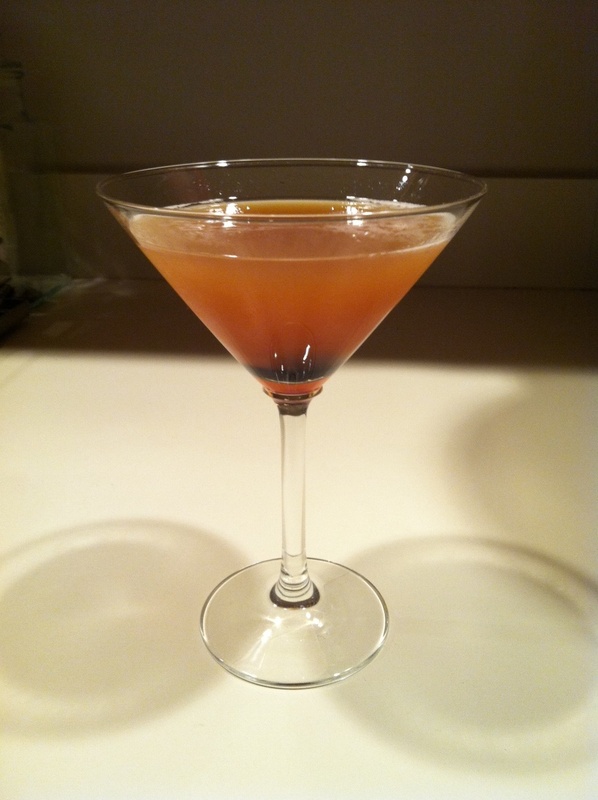 I started with a Bourbon-based Manhattan, but no matter how I adjusted the volumes of each component, the drink was too cloying for my liking. Branching into Negroni territory, I found that the mixture had an unpleasant contrast between the Campari and the peach puree, which echoed metallic overtones. The Boulevardier started me down the path of salvation, however. Starting with Rye Whiskey as the base and then building from there was the key. Rye is inherently less sweet than Bourbon and subbing a more floral Sweet Vermouth in lieu of Campari created a nice back drop for the peach puree. 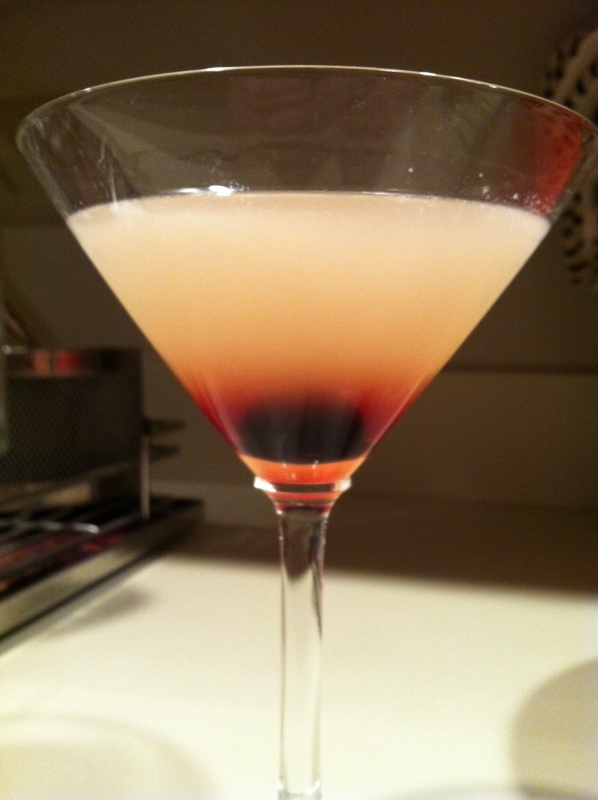 I decided to use a pre-mixed peach puree (I know, I know, don’t say it…) – the Stonewall Kitchen Bellini Mixer. The mixer is perfect because it contains a little sugar and a little citrus to intensify the body. I then thought that it would be nice to add a touch more floral to the blend, so I went to St. Germaine Elderflower Liqueur – nicely exotic. Lastly, to put an edge on the cocktail, I employed an equal mix of Angostura Bitters and Bittermen’s Hell Fire Habanero Bitters. The two played wonderfully off the tangy sweetness and lush floral qualities of the cocktail. So, why Harry’s Revenge? Well, first, I thought it would be nice to pull in the history related to the bar that gave us the Bellini and, second, I wanted to honor a man who is the consummate gentleman and gave me some of my fondest memories during my early years at Harvard – Harry Hawkes. Harry is a unique individual who has left a lasting impression on my mind and, almost more importantly, Harry loves a good cocktail. Combine the ingredients and shake vigorously with crushed ice. Strain into a chilled cocktail glass. Garnish with a Luxardo Maraschino cherry. Combine the first three ingredients and shake vigorously with crushed ice. Strain into a chilled cocktail glass and float the Crème de Cassis on the cocktail. The classic garnish is a lemon peel, but I choose to use a Luxardo Maraschino cherry for greater visual impact.